I have been finding a few Dragonfly’s recently, perhaps because of the generally warmer than usual weather, and the new location – a place I haven’t been to for many years. A nearby nature reserve that will soon become a horse track, I am told, so there may be some dung beetles soon to photograph … amongst the many creatures already to be found there. The site is huge and Dragons can be found all over at different times of day, some by the water where it is clear of trees and brush, some hunt in the fields, some can be found asleep or at rest in the shade where the brush meets the open track, others in the dark shadows. At present there isn’t a ‘best’ spot, maybe as the spring gets on after the winter solstice locations will be more determined – by the nature. There are many colours of Dragon though few individuals, and getting close to one can take a long time as they are inclined to take flight at the slightest disturbance in their view. Those big eyes are some indication of how sensitive is their sight. Along with being consummate hunters goes a correspondingly evolved survival instinct. Stillness is the key to observing these wonderful creatures, of mind and body, and the approach takes time and demands an attitude of respect for best results, in my experience. What exquisite clarity of focus and light. Beautiful. If you ever get to the US, plan a stop in New Orleans at the Insectorium. Great fun, although you give us a better view of the little ones. 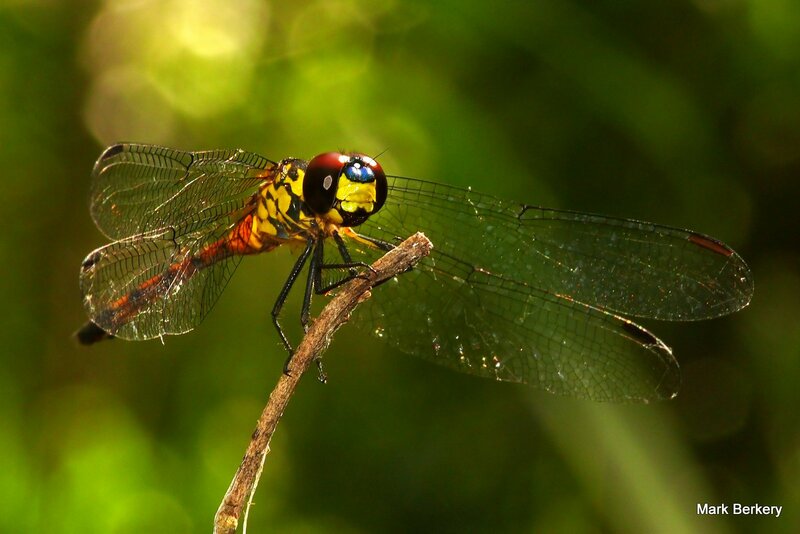 Can you, at least, tell us what continent these dragonflies are on? Ha, ha … I assumed everyone knows I am in SE Brisbane, Australia these days. This Dragonfly I have only found in the dark shadows of the denser wetter bush. Awesome, yet again Mark! Where do you find such beauties? Amazing creatures yes. I don’t advertise my locations Jenn, for obvious reasons, but I’ll email you details if you want. Maybe even get a group out there some time for a macro day, when the insect numbers are up of course. Indeed it’s difficult to capture photos of dragonflies that you wont move even if bitten with ants. I share you’re appreciation for dragonflies and can relate to your comments on the challenge of getting a good shot – which you managed to do very well!